Gingered Lemon Drop Cookies are as light as air, and the perfect lemon cookie with a sweet vanilla glaze, that is perfect for a bridal shower, Mothers Day tea, or just for that perfect little something sweet. 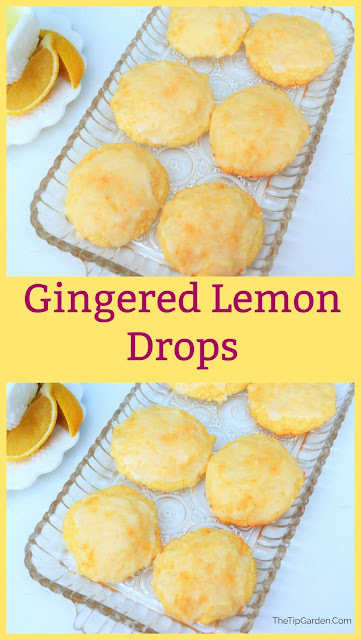 It's not overly tart like some lemon bars, and not overly sugary either, it's just the perfect breath of spring lemon air you are looking for! And not just for spring! I include these on my Christmas holiday treat trays too! They are perfect to mix in with all the super sweet treats on the tray, and believe me.. they don't last long! Top 10 Winner! This recipe made the top 10 in my city newspapers holiday cookie contest! I didn't win the contest, but it was an honor to have it chosen in the top 10 among so many entries! Jan's Tip: These cookies do not contain any eggs! The recipe mixes up light and airy! and the cookies do too! if you want them to flatten out just a tiny bit then flatten out your cookie dough ever so slightly on the baking sheet before baking, because these are so light as air.. they won't flatten out and "weigh down' unless you help them too! Line baking sheets with silicone mats, parchment paper, or lightly spray with nonstick cooking spray. In large mixing bowl, cream together the sugar and butter. Blend in sour cream and 1/2 cup lemon juice. Mix in flour, baking soda, salt and 1/4 teaspoon of ginger into butter mixture, blending well. Drop by rounded teaspoonfuls, two inches apart onto greased baking sheets. Bake 13-15 minutes or until edges are just starting to brown. 2 cups powdered sugar, 2 Tablespoons water, 1 teaspoon lemon juice, 1/8 teaspoon ground ginger. Mix well. Here's some more great #CookieWeek recipe's for you!